Rookie Reiner - Now available! I’m very happy to announce that Rookie Reiner is shipping from Amazon.com – YAY! You can still get it before Christmas in many urban centers. A breeding to a great stallion! 1)	Exceptionally cute children and puppies. 2)	Big suppers in the Superbarn complete with Margarita makers and bars. 3)	Rubbing shoulders with Lyle Lovett and William Shatner and realizing they are just guys at a horse show. 7)	Eating breakfast at Jimmy’s Egg – try the Eggs Benny. 8 )	Catching up with good friends you haven’t seen since the last Futurity (but you’ve kept up with on Facebook). 9)	Scoping out the newest trends in show clothes. I particularly like the emperor waist shirts coming out now. 10)	The Open finals on Saturday night. Must Not Be Missed. The motivational speaker exhorted us to change the way we live today, rather than looking always toward some vague distant futurity. “Futurity” is a forward-looking word with a literate past. Its first known use is in Shakespeare’s Othello, when the downtrodden Cassio, mystified about why Othello has turned against him, beseeches Desdemona to tell him whether his “offense be of such mortal kind / That nor my service past, nor present sorrows, / Nor purpos’d merit in futurity / Can ransom me into his love again.” The term was also used by Benjamin Franklin (“I must one of these days go back to see him . . . but futurities are uncertain”), and Sir Walter Scott wrote of events “still in the womb of futurity” (that is, events that hadn’t happened yet). Today, “futurity” often refers to a race, usually for two-year-old horses, in which the competitors are entered at birth or before, or to a race or competition for which entries are made well in advance of the event. 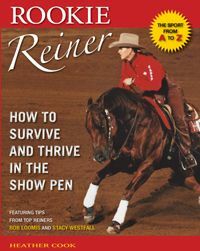 What I find interesting is that in the reining industry we use the term futurity to mean “reining event for three year olds” and that is the definition we’ve used to guide us through changes in the industry … changes to how we nominate and pay for our horses to compete in futurities at an elite level.